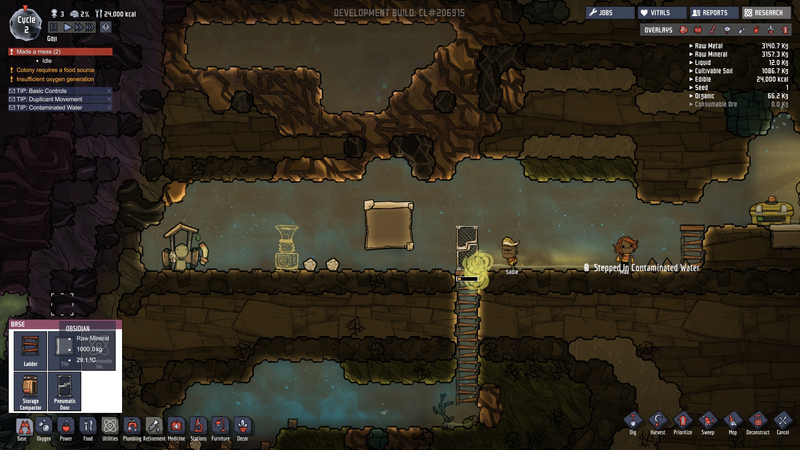 We take a dive into the alpha of the space colonization simulator Oxygen Not Included. 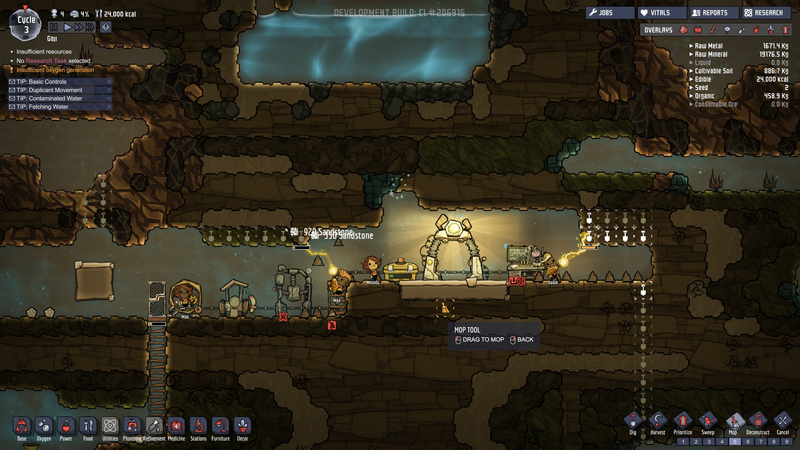 Last week, Klei announced the pre-release alpha of their space-colony simulation game, Oxygen Not Included. Players that are interested in participating in the alpha can pay their way in for $19.99 which is expected to increase further down the line. Being huge fans of all things Klei Entertainment, we decided to participate and get our first real taste of what life is like living under the surface of an asteroid. 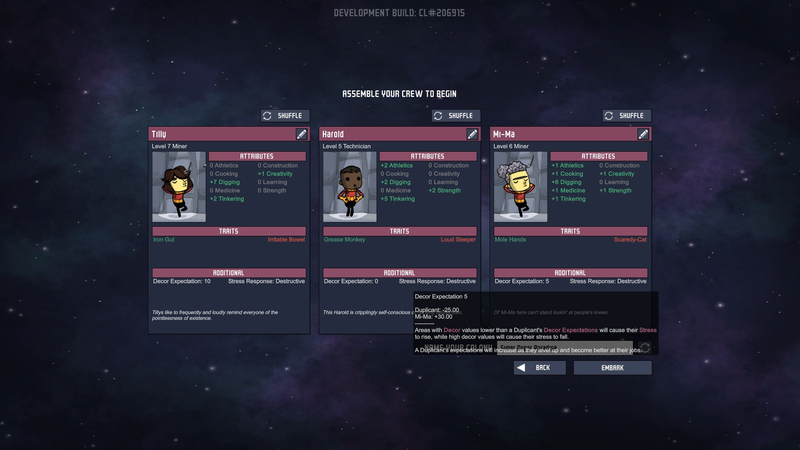 The first thing the Oxygen Not Included alpha asks you to do is assemble your crew. Right now, this consists of 3 people (or duplicants as the game calls them) with randomized attributes. Our initial thoughts when looking through potential inhabitants was that it was pretty difficult to settle on anyone that came up. While some had standout attributes, they were usually countered with costly traits and stress responses. Eventually, we settled on duplicants that fell somewhere close to the middle of the vast spectrum. Once you select your 3 inhabitants, you’d better get to resource collecting and building the basics. It doesn’t take long for them to start demanding food and utilities. Don't procrastinate since these things take time and raw materials to craft. Other factors such as warmth, oxygen, food, areas of relief, places of education, and reliable energy sources also come into play fairly early in the game. When we were looking for direction on where to start, it was important to consider the traits of the inhabitants and prioritize their needs. For example, a crewmember we selected had an overactive bladder. They were unable to reach the outhouse in time, which resulted in them soiling the entire area, and causing stress to their fellow colony members. Another member was becoming stressed out from the lack of nice decor. Allowing the people in your colony to become too stressed or overworked will result in some consequences. Some inhabitants become destructive when stressed, destroying everything in their path and undoing all of your (*their) hard work. Others just took to vomiting all over everything. While it's not desired, it's pretty hilarious to watch how things in the colony unfold. In that way it's very reminiscent of Klei’s title, Don’t Starve. It's all about finding a balance in keeping up the duplicant's stats while trying to advance. In true Klei fashion, the unpredictable is what keeps you on your toes and makes the game wildly entertaining. You might think you have everything under control until something weird and offhanded, like an inhabitant projectile vomiting all over everything, happens. This is because the further you progress into the Oxygen Not Included, the more you'll realize that it's not about micromanaging individuals but creating the type of environment that everyone in your colony can successfully work and live in. Because of this, accidents are bound to happen. 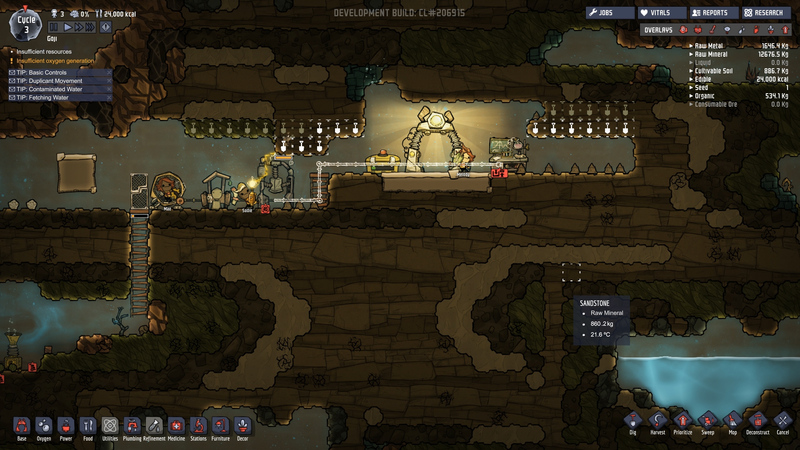 Overall, the Oxygen Not Included pre-release alpha was incredibly enjoyable to play, even in its very early stages of development. If you were unable to get into the alpha, you can expect the title to eventually launch into Early Access on Steam. Check out the blog Klei posted which includes the road map for Oxygen Not Included as well as other interesting details surrounding the game.